Cogan is a leader in the tenant storage locker industry and has the products to meet your specifications. Please contact us to discus the storage requirements of your project. Make the most out of your basement storage area with Cogan single or double tier tenant storage lockers. Designed especially for the condominium industry, our tenant storage lockers provide more of everything you need – a clean, attractive design, simple assembly, adaptability and affordability. The double tier tenant storage lockers offer the same 24-hour security as our single tier lockers without the need for additional square feet. These is ideal when storage space is limited. Cogan double tier tenant storage lockers feature 7’0”, 7’6” or 8’0” freestanding posts. All panels, dividing shelves and swing doors are made of heavy-duty 2”x2”x10GA welded wire mesh framed in 1 ¼”x1 ¼”x12GA structural angle and sealed with a powder-coated grey paint finish. Transom angle is attached to the front and runs along the top of each unit, creating a superior reinforced frame. Roof panels are made of 2”x2”x6&8GA or 2”x4”x10GA galvanized welded wire mesh. 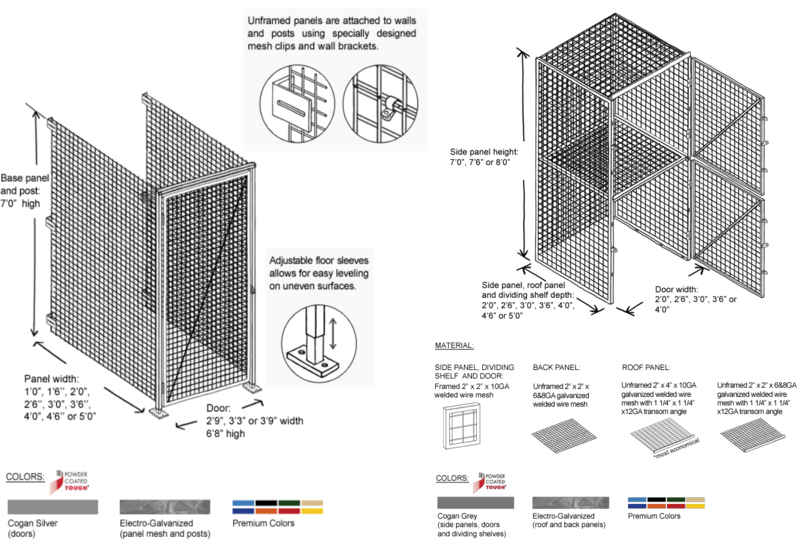 Back panels are made of 2”x2”x6&8GA galvanized welded wire mesh. The open wire mesh construction is maintenance-free and allows for proper ventilation and full light penetration. Your property remains in top condition and in constant view. Cogan double tier tenant storage lockers are available in a variety of standard sizes to meet your needs. Custom sizes are also available. Simple nut and bolt connections allow for fast assembly and seamless adaptability. Our double tier lockers can be installed using on a few basic hand tools. This eliminates the need for skilled labour, saving you valuable time and money. * Padlock hasps and door stoppers come standard with all double tier tenant storage lockers.